Want to expand your rhythmic horizons? While some will find the lack of CV inputs a problem, Circles is all about play and it certainly excels here. Easy and fun to jam with. Can also be used as a straightforward step sequencer. 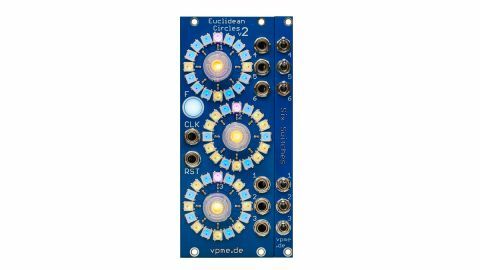 Euclidean Circles was originally released as a DIY PCB in late 2015, and now VPME is back with version 2 and a full retail release. The module is essentially a gate sequencer, but as the name suggests the focus here is on Euclidean rhythms. Euclidean algorithm is a theory presented in 2004 by a Canadian computer scientist that shows how most rhythmic patterns of world music (except Indian) can be generated by filling patterns with beats that are (as much as possible) evenly spaced. When you try and play five hits in a 16-step pattern they cannot fit evenly so a more interesting off-beat rhythm is created. If you play two patterns of differing lengths off against each other you create poly-meter. The interplay between the rhythms creating patterns that seem much longer than their component parts. So how does it work in practice? Three large LED dials take up most of the front panel, each with a glowing encoder in the centre. Pressing the central encoder on each channel cycles the mode through three colours: blue controls the length of the pattern, orange controls the density of beats and red controls the start/reset point. Patch in a clock or set the tempo on the module itself and you’re away! The first thing you’ll notice is how amazing this module looks, particularly once it’s set in motion with the patterns all ticking away. The LED rings give instant visual feedback. Basic operation is very intuitive and it’s quick to get some rhythms working. There are six patterns available but only three dials on the panel. A push of the F Button or a long press on the top encoder switches control from rhythms 1-3 to 4-6. The colour of the LEDs is different for the second set, making it a lot easier to remember where you are. For simpler beat programming, each encoder can also be set to step sequence mode where steps are entered manually. Whichever mode you’re in, two or three patterns can be chained together for a maximum 48-step pattern. The Six Switches expander gives you direct muting control over each of the six patterns, which really adds to the playability. If you’re getting this module we’d definitely grab the expander too. The big change in V2 is the F Button which can be programmed to provide a variety of functions including picking presets, toggling between odd and even presets and inserting fills. I didn’t find the Fill mode particularly useful but toggling between presets is a good way to inject variety when playing live. Going deeper, there is a settings menu which lets you configure the module to your needs and playing style; this is well thought-out but you will definitely need to consult the manual during setup. We had the most fun using Circles as a CV source for Mutable Instruments’ Plaits. Attenuated gates provide rhythmic modulation – great for adding variety. With six outputs, there’s plenty scope for providing both rhythmic gates and CV or other clocking duties at the same time.